Yesterday, I did this nail art or manicure which I thought of sharing with you all today. 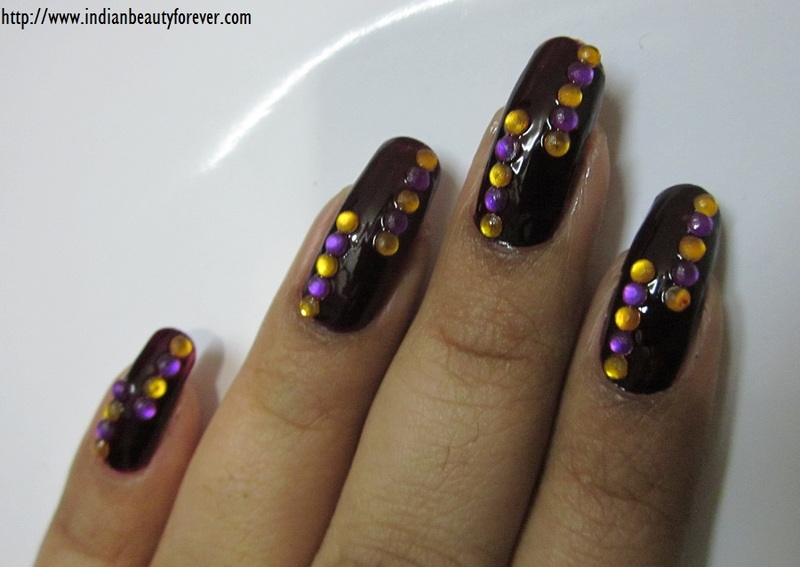 I have started giving all my nail arts some names and this one I have named as dark Fantasy. lol..:) I am a big fan of my Friend Puja's nail art who's a professional. Honestly, she is the one who inspires an amateur like me!! I have never used such a dark shade ever. It's actually a deep plum shade that appears more like black here. You saw it, i was about to post it here, thank you so much dear for liking it!! Wow pretty mani! such a cool look! Its the first time i have used dark nail paint. kudos to uuuuuu...creativity is in ur hands..
My kind of fantasy too ;) come do my nails, heh. The blings remind me of jellybeans! Sure will do that for you !! could not think of any other name. I was so anxious to see a new manicure from you, and here it is a stunning one. Love it! My favs are pinks, oranges and reds.